RIT was selected to join Chevrolet’s Campus Clean Energy Campaign for its leadership role in sustainability and energy efficiency on campus. 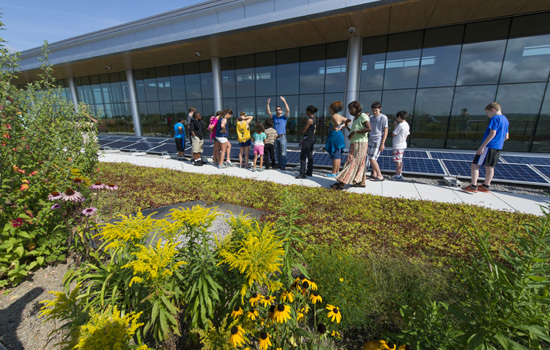 The Golisano Institute for Sustainability facility is RIT’s fourth LEED-certified building on campus and features a green roof among other environmentally friendly components. Rochester Institute of Technology is among 12 colleges and universities—including the first in New York state—that will help drive Chevrolet’s Campus Clean Energy Campaign designed to reduce carbon emissions. RIT was selected for its leadership role in sustainability and energy efficiency on campus, resulting in Chevrolet’s invitation to participate in the new initiative to retire carbon credits on behalf of the environment. The university is among a second wave of colleges and universities that have announced participation in the initiative today on Campus Sustainability Day, which has been celebrating sustainability in higher education nationally since 2003. As a result of ongoing sustainability initiatives, RIT officials estimate that the university will sell Chevy carbon credits—a financial instrument used to tally the amount of carbon dioxide removed from the atmosphere—yielding up to $100,000. The money will be reinvested in energy efficiency and sustainability projects on campus to help further reduce RIT’s carbon footprint. Carbon market trading is a form of emissions trading that specifically targets carbon dioxide. This form of trading is a common method countries utilize to meet their obligations specified by the Kyoto Protocol, namely the reduction of carbon emissions in an attempt to reduce or mitigate future climate change. RIT announced the release of its initial Climate Action Plan in 2011, putting the university on track to be carbon neutral by 2030. Completion of the Climate Action Plan was the result of RIT’s participation in the American College and University Presidents’ Climate Commitment, a pledge by academic leaders to move their campuses toward climate neutrality through more sustainable programs and practices. President Bill Destler signed the commitment in 2009, and in November 2010, the American College and University Presidents’ Climate Commitment appointed Destler to its steering committee. The initial plan establishes a framework for RIT to achieve climate neutrality by 2030. The plan is being updated every two years with increasing metrics and details on the university’s progress. Earlier this year, the Golisano Institute for Sustainability (GIS), a world-class “living lab” that represents RIT’s ongoing commitment to the environment, was certified Leadership in Energy and Environmental Design (LEED)-Platinum by the U.S. Green Building Council (USGBC)—the highest standard that can be achieved in the rating system. The USGBC named the RIT facility “exceptional” and rated it among the top 1 percent of all green buildings in the United States today. The expansive 84,000-square-foot building houses the institute’s Ph.D. program in sustainability and master’s programs in sustainable systems and architecture, which has a strong focus on sustainability. The GIS facility became RIT’s fourth LEED-certified building on campus and the university’s second LEED Platinum project after the University Services Center earned the designation in 2010. RIT has two other LEED projects pending with Sebastian and Lenore Rosica Hall and Institute Hall. In addition to its buildings, RIT has undertaken extensive energy conservation measures in recent years, including significant physical plant and lighting upgrades as well as other innovative strategies. Earlier this year, the university enacted a new energy policy, outlining new building temperature set points. In addition to the set points, the policy outlines individual behavior changes, including dressing appropriately for the weather outside as well as a program to swap space heaters for floor mats. As part of Chevy’s voluntary carbon-reduction initiative, the automaker has helped develop a formula in which select colleges and universities can earn money for certain upgrades that reduce greenhouse gases (GHG) emissions. Through the initiative, Chevy will buy carbon credits resulting from GHG reductions in either LEED-certified buildings or other campus-wide, energy-saving initiatives and retire them permanently to benefit the planet. This means they will not be used to offset emissions related to specific Chevrolet operations or products—or those at any other site. The Chevy program is part of the automaker’s voluntary goal set in 2010 to prevent up to 8 million metric tons of carbon emissions from entering the earth’s atmosphere and contributing to global warming. To develop the new methodologies, Chevy worked with an advisory team led by the Climate Neutral Business Network, with support from the Bonneville Environmental Foundation, the USGBC and the Association for the Advancement of Sustainability in Higher Education. The methodologies have been approved through the Verified Carbon Standard. One USGBC official with personal ties to RIT is glad to see the university on board with Chevrolet. The RIT community is invited to follow the sustainability conversation on Twitter and use #CleanEnergyU to tell Chevrolet about campus clean-energy efforts.